North Korea’s April 9 test of a large liquid-fuel engine is a disturbing development that not only highlights the growing threat posed by Pyongyang but should also put to rest, once and for all, all claims that the North’s WMD programs are a hoax. In fact, the test demonstrated that North Korea has an even greater capability at a more advanced state of development than previously anticipated. The North Korean test involved a tightly-coupled pair of propulsion units from an old Soviet submarine-launched ballistic missile (SLBM), known as the R-27 or the SS-N-6 “Serb.” North Korea has long been believed to possess this technology, but it was never confirmed before now. This engine uses high-energy propellants that would give a missile greater range than Pyongyang’s traditional mix of kerosene and nitric acid. Using this technology, North Korea’s road-mobile intercontinental ballistic missile (ICBM), the KN-08 or the KN-14 modification, could deliver a nuclear warhead to targets at a distance of 10,000 to 13,000 km. That range, greater than had previously been expected, could allow Pyongyang to reach targets on the US east coast, including New York or Washington, DC. If the current ground test program continues and is successful, flight tests of a North Korean ICBM could begin in as little as a year. Moreover, Pyongyang may be able to deploy this delivery system in a limited operational capability by 2020. For more than a decade, experts have had reason to believe North Korea had obtained from Russia the technology for an old Soviet submarine-launched ballistic missile—the R-27 “Zyb,” or to old-school Cold Warriors, the SS-N-6 “Serb.” But until recently, the evidence was circumstantial: Russian engineers traveling to Pyongyang, parade models that look like the old Soviet missile, a discrepancy in the accounting of ex-Soviet hardware after the Cold War, but never any clear proof such as a North Korean test of Soviet hardware. We had begun to wonder if maybe some enterprising Russian schemers had sold the North Koreans a warehouse full of rusty hardware that could never fly again. And from the day the KN-08 road-mobile ICBM first paraded through the streets of Pyongyang, there was speculation whether it might use this technology. The KN-08 is a much larger missile than the R-27, and while elements of the R-27 might be a good match for the upper stages, the R-27’s Isayev 4D10 engine was simply too small to lift the missile. It was possible that the North Koreans might be able to scale up the 4D10 engine, or cluster two or three of them together, but that would have proved challenging for their engineers. The simplest hypothesis was that they would use their old Scud or Nodong missile engines for the first stage—the same approach that had taken with the Unha satellite launch vehicle (SLV). Figure 1. The April 9 liquid-fuel engine test. 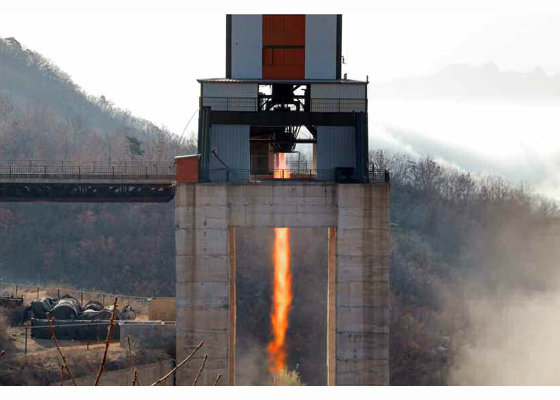 For months, the North Koreans had been modifying their vertical rocket engine test stand at the Sohae Satellite Launching Station for testing larger rocket engines. They completed that effort last month and there were some signs that a test might be in the works. Conveniently, the North reported this test on the day I was attending a conference of American rocket experts, some of whom had worked with America’s old liquid-fueled ICBMs. The immediate consensus was that this was no Nodong or any other engine reflecting North Korea’s traditional missile designs. But it was a very good match for a pair of 4D10 engines clustered together into a propulsion unit for an ICBM. This ICBM would be more capable than previous thinking on what the North could build, and also possibly closer to deployment than had been anticipated. Looking at a close-up of the test, what appears from a distance as a single engine shows two exhaust plumes almost adjacent to one another, emerging from a hemispherical dome at the base of a stubby cylinder. The engines themselves are not visible. As the R-27 missile was designed for use in the tight confines of a ballistic-missile submarine, critical space is saved by putting the 4D10 engine inside the missile’s fuel tank with only the end of the nozzle projecting below. The Soviet Union went on to use this feature in more advanced submarine-launched missiles, some of which remain in service to this day. North Korea appears to be retaining the submerged-engine configuration, but with two engines instead of one. As the 4D10 engine normally includes a complex assortment of pumps, valves and other plumbing wrapped around the nozzle and thrust chamber, this isn’t a simple matter of putting two stock engines side by side, but rather indicates a substantial modification of the original design. Possibly some components are now shared between the two tightly-coupled engines. It would still be better to use a single, larger engine—one small bit of good news in this test is that it seems to indicate that North Korea still lacks the ability to design (or buy) engines any larger than the 4D10. Figure 2. Close up of the engine test. Also visible are the exhaust plumes of smaller rockets on each side of the main nozzles, another feature of the 4D10 engine. The most efficient way to steer a missile is to mount the main engine on gimbals allowing it to swivel a few degrees in any direction, but that’s not really practical if the engine is inside the fuel tank. Instead, Soviet designers gave the 4D10 an independent pair of vernier engines on gimbaled mounts outside the tank. Those smaller engines appear here in about the same place as they would on stock 4D10 engines. Perhaps the most spectacular difference between this test and anything previous ones conducted by Pyongyang is the clean, translucent orange exhaust. Scud and Nodong missile engines burn kerosene fuel, which almost inevitably produces soot and thus an intense, solid orange flame. The plume from these engines retains the orange hue, indicating carbon in the fuel but without the soot. 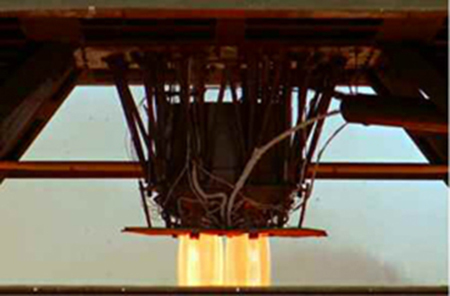 Some of the internal detail of the plume as it leaves the engine and interacts with the surrounding atmosphere is visible. In the longer views, there’s no sign of the black, smoky exhaust we would expect from a kerosene-burning engine. There are several fuels that could produce this sort of flame, but the only one we’ve had any hint of from North Korea is something called unsymmetrical dimethyl hydrazine (UDMH), which in combination with nitrogen tetroxide oxidizer is believed to power the small third stage of North Korea’s Unha SLV. These propellants are more efficient than the crude kerosene and nitric acid of the Scud and Nodong missiles, which is why the Soviets adopted them for the R-27. Until now, there was no sign that the North Koreans were using them in any large rocket engine. In short, the North Koreans have demonstrated something we only suspected them of working on and have done it on a larger scale than anticipated. Moreover, these test images are sufficiently precise, accurate and detailed that Photoshopping or other fakery can be ruled out. The exact scale is difficult to discern, but the relative dimensions and geometry at least are consistent with a pair of closely-coupled 4D10 engines packaged in the base of a KN-08 or KN-14 missile fuel tank. And while still photos don’t tell us how long the test ran, the engines appear to have achieved a steady-state operating condition. The recent test helps solve a minor puzzle that was raised when North Korea teased us with a carefully-cropped photo of the base of a KN-08 missile last month. That photo suggested two closely-coupled engines, but with nozzles a bit over 50 cm in diameter—too large for a Scud, and too short for a Nodong. True, a Nodong engine could have had its nozzle cut down to fit the KN-08 engine bay, but that seemed unlikely and inelegant. The nozzle of the 4D10 engine is just about right for what we saw. So are the positions of the vernier engines. And while we’ve never seen the base of the KN-14 missile (the Pentagon’s new name for what we had called the KN-08 Mod 2), the external configuration of the first-stage engine bay is identical so it probably uses the same twin-pack 4D10 engine. Since the KN-08 and KN-14 are almost three times the weight of the old Soviet R-27, would two 4D10 engines be sufficient to power it? Three would certainly be better, but might be an impossibly tight fit. With only two 4D10 engines the missile would climb away from the launcher with an acceleration more suitable for an airliner than an ICBM. But unlike the airliner, the ICBM’s performance would increase dramatically as the fuel load burned away. The slow initial acceleration will cost the North Koreans a bit of performance, but unless they wind up launching with American missiles literally seconds from hitting the launch site, it won’t matter in the end. In the end, the 4D10 engine is about 15 percent more efficient than North Korea’s kerosene-burning Scud and Nodong engines. And the submerged installation allows for bigger tanks carrying more propellant. Even with the lumbering initial climbout that will give the North substantially longer range. With a 500 kg warhead, the KN-08 is now estimated at having a range of over 11,500 kilometers, compared to 9,500 km using Scud-technology engines in the first stage. That’s enough to reach New York City or Washington, DC from North Korea. Even the two-stage KN-14 can reach over 10,000 kilometers with a light warhead, enough to cover all of the US west coast. The only good news from the recent test is that it didn’t include a complete first stage. Analysis of commercial satellite imagery suggests that the Sohae test stand was recently modified to use new propellants, so this may have been the first full test of the dual-engine ICBM power plant. But Kim Jong Un himself was present, and given the likely penalty for embarrassing Kim with a failed test, it is reasonable to suspect the engineers had high confidence from earlier testing of single 4D10 engines. The most recent 38 North assessment of the status of North Korea’s ICBM program assumed an additional two to three years of ground testing would be required before North Korea would be ready to conduct the first flight of a new ICBM. However, based on last week’s engine test, and recent video of Kim Jong Un observing reentry vehicle ground testing, North Korea might be far enough along to conduct flight tests in as little as a year. It won’t happen tomorrow—they still have to actually build the first stage, and will almost certainly want to test the complete stage on the ground before it is launched. If the North Koreans can launch an experimental ICBM early next year, chances are it will not work as planned. (North Korean missiles almost never work the first time.) But the timeline has moved up, and an initial operational capability for the KN-08 or KN-14 of about 2021 rather than 2023 is entirely possible. There is a small chance that the missile could enter limited service by the end of this decade. Large-scale deployment would require the ability to manufacture complete 4D10-class engines from scratch when they may still be using ex-Soviet hardware for key components like turbopumps and injector plates. But while this requirement may result in some delay, it is an obstacle that the North Koreans can overcome in time. Whether the increased pace and visibility of North Korea’s WMD activities across the board will continue remains unclear. Certainly, Pyongyang has pulled back the veil normally surrounding research and development activities to give the international community a glimpse of its efforts. That should put to rest the reoccurring argument by some experts that the North’s nuclear and missile programs are a hoax or are fake, as Pyongyang clearly intended these actions to add credibility to their threats. This behavior may continue, may be a reaction to the current joint US-ROK military exercises or could be part of the run-up to the coming Party Congress. Whatever the reason, North Korea is clearly moving full-steam ahead with its threatening programs.